I've come to really appreciate the NIV translation for it's readability and accessibility. For my own study, I typically opt for a more literal translation like the ESV or CSB, but I love using the NIV when I'm teaching students because it stays true to the message of the text while putting it in a way that may sound a little more like the way we speak today. Quite frankly, that's a lot of resources. 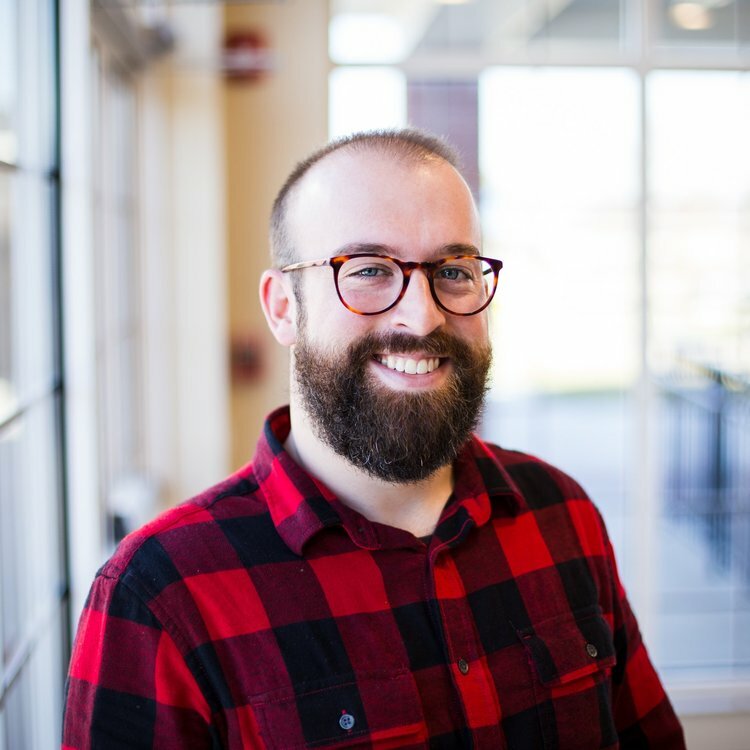 Their idea is that each of the resources listed above explores the Bible in a different way whether that be theme, note styles, note focus, maps, etc. So they've combined the best of all of them to allow the reader and new student to the Word to figure out which style best suits them and gives them the clearest understanding. However, I would argue you don't have to be new to the Bible to benefit from this study Bible. As I was browsing, I learned things I didn't know from various notes and features. Design wise, I think this is an attractive Bible. The dust jacket looks good. The theme of navy and yellow that runs throughout the notes in the Bible is very attractive. Zondervan is once again using their new ComfortPrint font, which is very easy on the eyes. If I had one complaint in the design, it would be that hardcover beneath the dust jacket in the version I received is just ugly. It's a pale glossy blue without much design and it's ugly. If I regularly use a hardcover Bible then I ditch the dust jacket, but I wouldn't ditch this one because it is such a better looking design than the hardcover underneath. Maybe it was a choice to save money, but it is not attractive. Frankly though, you're buying this Bible for the content and not the cover and thankfully the content is what shines. 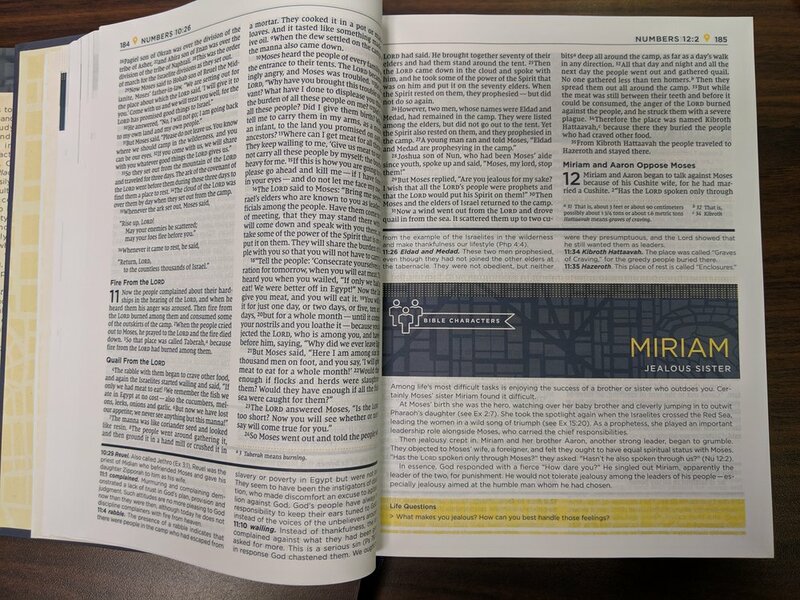 You will notice a helpful section when you open this Bible called About the NIV Starting Place Study Bible. In this section, it will tell you how to use the various notes included. This Bible truly is filled with all different kinds of helpful notes and that's what makes it such a valuable resource. 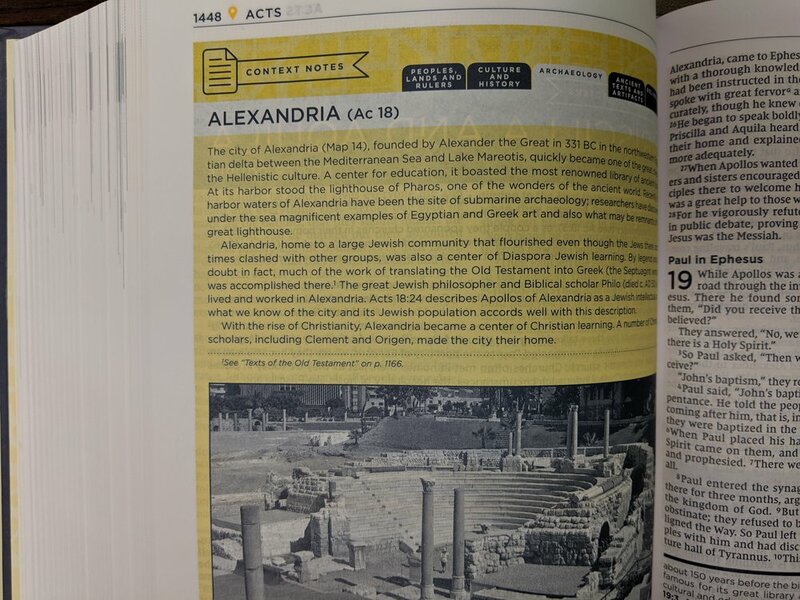 There are study notes at the bottom of each page, context notes explaining historical significance of certain things you'll encounter in the Bible, Q&A notes giving "easy-to-grasp" answers to tough questions you may have as you study, sections with information on Bible characters, and Bible truths that highlight important truths found in Sciprture with questions to help you relate that truth to your life. This truly is a valuable resource. In the back you'll also find various reading plans to help you start consistently getting into God's Word. What really shined to me as I browsed the notes of this Bible is the fair and balanced approach it takes to some of the more debated themes in Scripture. I didn't think it pushed the reader to embrace one side or another, but laid out both sides leaving the reader to further study and decide where they land. I think this is an important detail in a Bible for new believers. There are several doctrines out there true believers hold different convictions about and laying them out and letting the new believer arrive at their own conclusions is helpful. All in all, if you are a new believer then this is a great resource for you. If you're someone who'd like to engage with different types of study Bibles all in one study Bible then this is a great resource for you. If you're someone looking for a good study Bible to suggest to new believers then I'd highly recommend this to be your new go-to. 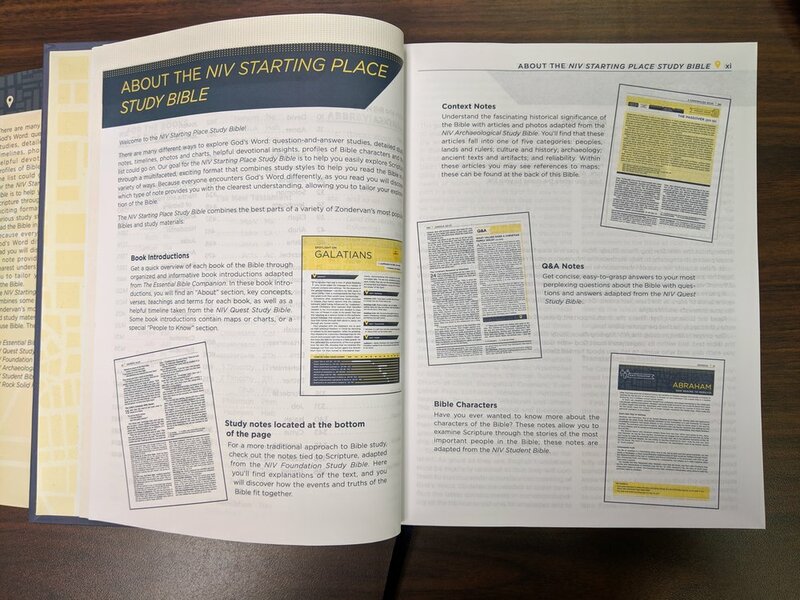 The NIV Starting Place Study Bible is a valuable resource from Zondervan that will be a great aid to many people. 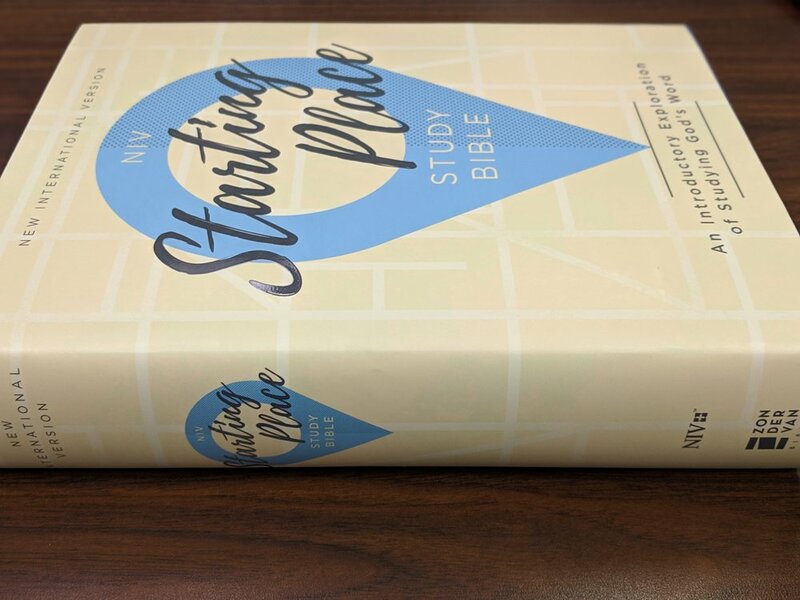 You can pick up your copy of the NIV Starting Place Study Bible on Amazon. Disclaimer: I received a complimentary copy of this resource from BookLook Bloggers in exchange for a fair and honest review.